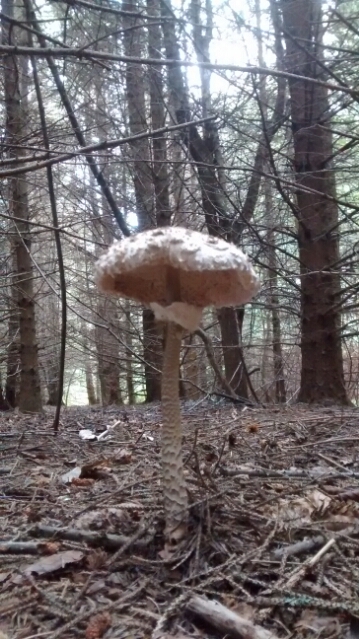 These large, majestic, edible fungi are most common in woodland clearings and on their grassy fringes. They can grow alone but often in groups. You can also find them on verges and established (permanent) pasture. In Britain then tend to grow between July and November. The cap of the parasol starts as a small, pale brown orb with a slightly darker area at its zenith. As is grows, flattens and expands this breaks into scales. The brown bump in the centre remains. When cut the flesh of the cap does not change colour much and remains white. A mature specimen has a cap diameter of between 10 and 25 cms. Avoid specimens smaller than this. 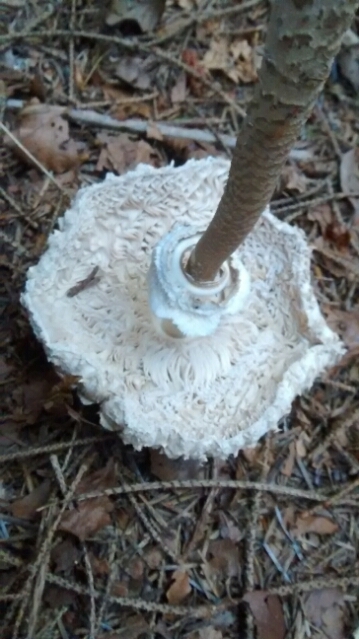 The gills of this parasol are broad and crowded. They are white of off-white (cream) and are markedly free from the stipe. In these pictures the crowded gills are wavy as the parasol in this specimen has not fully extended yet. 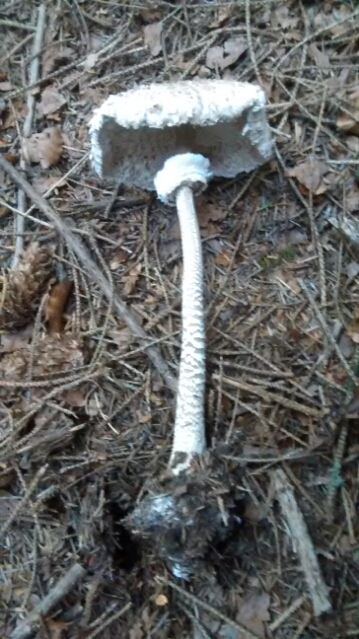 The spore print is white. 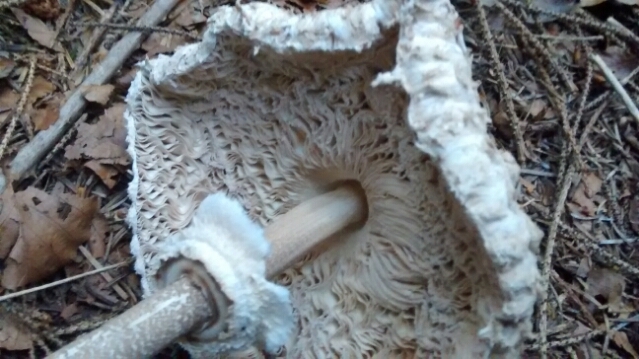 The stem usually has a large double-ring. This can loosen and can fall to its base. 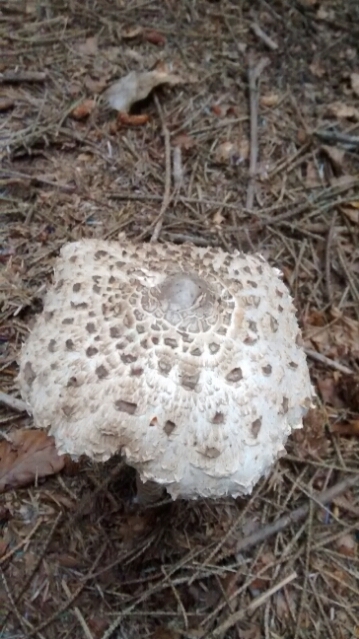 The stem is pale cream or white, smooth in texture and has small brown ‘snakeskin’ scales or bands. The stem above the ring is very smooth and has no pattern. If you break open the stem you will find it loose (ie not dense) and fibrous. However the stem is quite robust and tough. Sometimes the stem will be hollow too. At its base the stem is bulbous (c.2.5cm). At is top it is slightly tapered (1/5cm). Disclaimer – This article is NOT telling you to go out and eat wild plants without proper instruction! DO NOT use this article as a guide as to what is safe for you or others to eat. Learn from other sources and know absolutely (110%) what you are picking and consuming and what affect it might have on you and others – before you go off and test your knowledge! The author accepts no responsibility for any errors or omissions in this article. Eating wild plants is entirely at your own risk. Just because I have eaten them and/or they are mentioned in this article does not mean that they are safe for anyone to eat. Do not feed wild plants to other people without taking the necessary precautions. This entry was posted on Monday, August 25th, 2014 at 4:33 pm	and posted in misc. ramblings. You can follow any responses to this entry through the RSS 2.0 feed.